NRC officials participate in an exercise at the headquarters Operations Center. The Operations Center will be active with officials participating during the upcoming Southern Exposure 2015 exercise. 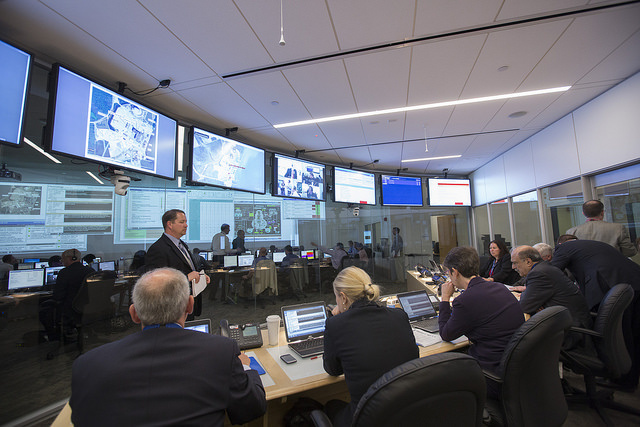 Every year, NRC managers and staff members in headquarters and the agency’s four regions participate in nuclear power plant emergency exercises. The plants are required to exercise their plans every other year, and NRC response team members use these exercises to keep their skills sharp and to identify areas for improvement. The exercises provide valuable experience and make each plant’s overall emergency response program better. State and local responders and the plant staff have a crucial role in each of those exercises, but many federal agencies that would be involved in an actual serious nuclear emergency rarely participate. In a little more than a week, the NRC, along with state and local officials in South Carolina, Duke Energy, FEMA and the Department of Energy, will stage a full-scale exercise at the Robinson nuclear plant in South Carolina. It’s being called Southern Exposure 2015. This exercise will bring together not only the usual exercise participants, but also many other agencies that would have a role in a real event. In addition to the NRC, FEMA and DOE, federal agencies participating include the Departments of Agriculture, Health and Human Services, Labor, the Interior, Transportation, Veterans Affairs and the Environmental Protection Agency. Southern Exposure 2015 will begin on Tuesday, July 21, with activities much like the exercises the NRC regularly sees. On Wednesday, July 22, the NRC will be joined by those other federal agencies in a broad response to the simulated events at the Robinson plant. The NRC and the other federal agencies will work closely with state and local officials and Duke Energy’s plant operators and managers to achieve the objectives of the exercise. Victor McCree, the Regional Administrator for Region II, will serve as the NRC’s Site Team Director for Southern Exposure 2015, leading the NRC team in South Carolina. The NRC will also support the exercise with staff in the regional office in Atlanta and headquarters in Rockville, Md. While McCree has participated in countless exercises, he acknowledges this one is unique. It’s a rare opportunity, he said, to work with so many organizations across federal, state and local governments as well as the private sector. People living and traveling near the Robinson plant during the exercise may hear and see actions associated with the simulated response. These could include response vehicles, field monitoring teams and low-flying aircraft, but the exercise should not affect normal traffic or other activities in the area. While the likelihood of a severe nuclear accident in this country is low, the Southern Exposure 2015 exercise is designed to allow all the organizations involved, federal, state and local, to address the simulated accident’s effects on the economy, environment and public health – and be better prepared to respond if the events were real. The hurricane season officially began June 1, but this year the Carolina coast experienced a tropical storm named Ana in early May. While Ana produced winds of more than 60 miles an hour near the Brunswick nuclear plant, there was no major damage. It did, however, serve as an early reminder of the NRC’s role in ensuring nuclear plants remain safe during damaging winds and storm surges. 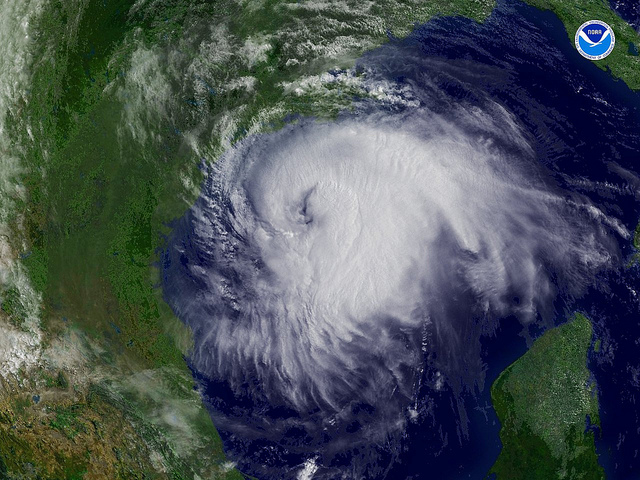 A hurricane as seen by satellite. Be assured, it’s not a current photo and is NOT happening now. The NRC has years of experience with hurricanes and other severe storms. Nuclear facilities were affected by Hurricane Andrew in Florida in 1992, by Katrina in Louisiana in 2005, by Sandy along the East Coast in 2012 and by many others. Although the National Oceanic and Atmospheric Administration predicts fewer storms this year than the historical average, any storm can be dangerous. How does the NRC oversee the safety of nuclear plants and other facilities during these storms? The NRC staff monitors tropical storms as they form, and if the projected path is towards the coast, the agency’s regional offices begin continuous tracking. If a storm’s path shows the possibility of it affecting a nuclear plant or other NRC-licensed facility, the NRC collects more information on the storm and NRC resident inspectors check the plant’s preparations. Depending on the projections, additional NRC inspectors may be dispatched to some nuclear plants. Around 12 hours before predicted hurricane-force winds, nuclear facilities that may be in the path provide the NRC updates and NRC inspectors monitor the plant staff’s actions. Plant procedures require the plant operators to shut the reactor down if winds greater than a certain speed are expected on the plant site. Nuclear plants are built to withstand all expected local meteorological events, including hurricanes, and actual storms have shown that plants can safely shut down and with little or no damage to important safety equipment. The NRC stays in contact with plants and NRC inspectors on site as the storm passes over, and the agency has backup systems if regular communications channels are lost. Once the storm is over, the NRC and FEMA assess damage and make sure local emergency response organizations can resume their normal roles. If the plant shut down, it will only be restarted after the NRC is satisfied there is no damage to safety equipment and emergency response capabilities have been restored. Fortunately, most tropical storms and hurricanes do not adversely affect nuclear plants, but the NRC is ready in case one does. 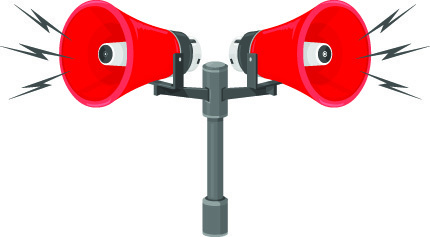 Residents of St. Charles Parish, Louisiana, who live within the 10-mile emergency planning zone for the Waterford 3 nuclear plant, got an unexpected benefit last week when 37 emergency sirens were sounded for a tornado warning. St. John Parish is similarly protected by 36 sirens. But thousands of other residents who live in surrounding parishes have no sirens. The reason: The NRC and FEMA work together to make sure the commercial nuclear power plants in this country have sirens around their sites to alert the public in the event of a serious incident. Various federal, state and local agencies also have emergency notification systems they can use to alert the public to a variety of emergencies — including one at a nuclear plant. “The people of St. Charles Parrish got the benefit of the emergency sirens that surround Waterford 3,” said Ron Perry, the Director of Emergency Preparedness for Homeland Security in St. Charles Parish. Each nuclear plant is required to exercise its emergency plan with offsite authorities at least once every two years – which includes checking the siren systems. This helps make sure the plant operator, and state and local authorities, can implement their emergency plans if needed. If all goes according to plan, the interface among all these agencies is seamless. But things do not always go as planned. Last year, while preparing for an upcoming emergency exercise at the plant, the National Weather Service inadvertently alerted the public around the Cooper Nuclear Station in Brownville, Neb., of an unspecified emergency at the plant. The weather service was updating the wording of messages stored in a computer system when someone pushed the wrong button. This sent an advisory to various news media organizations and some members of the public. The weather service quickly realized what happened and sent a message explaining the error to the media 13 minutes later. But, the mishap received plenty of news coverage. Unfortunately, this was the second recent incident about emergencies at the Cooper nuclear plant. On July 24, Nebraska Public Power District workers were working on a computer system that controls sirens in Nemaha County when a false alarm was broadcast. Last summer, Pacific Gas & Electric Co. workers were upgrading their siren system around Diablo Canyon when they inadvertently activated one at 3:30 in the afternoon. It sounded continuously for 14 minutes before workers were able to deactivate it remotely. It took 10 minutes before county officials sent out an advisory noting the error. Some people vented their anger about all the confusion on the county’s Facebook page, and several local TV stations and the Associated Press carried reports about the incident. Not a week later, something similar happened in Washington State. During a training class at the state Emergency Operations Center, a staffer inadvertently faxed a partially filled out form for an Alert (the second lowest level of nuclear emergency) at Columbia Generating Station. The fax went to nine different emergency management agencies, including one in Canada. A second fax was quickly sent out correcting the error. The NRC is primarily concerned with the reliability of sirens. The NRC tracks the performance of licensee alert and notification systems by measuring the number of successful siren tests conducted quarterly at each plant. These types of incidents are embarrassing to all involved and in each instance corrective actions have been taken to minimize the chance of future mishaps. But the bottom line is that residents in the communities around nuclear power plants need to heed the warning, and trust the emergency alert systems. A few false alarms should not change their response. If you hear a siren, or get a text message on your phone announcing an emergency, please heed the warning. September is National Preparedness Month, a time each year to reflect on the importance of knowing what to do before, during and after an emergency. The first step in preparing is to know your hazard. Once you do, FEMA has a wealth of resources to help you plan. A key part of the NRC’s mission is to make sure adequate plans are in place to protect the health and safety of the public. We require plant operators to develop emergency preparedness plans and regularly practice carrying them out in emergency exercises that include first responders and local and other federal government agencies. These exercises test the skills of those who would respond in a real emergency and identify any areas that need to be addressed. We assess the operators’ performance during exercises. As part of our regular inspections, we also make sure the operators’ emergency plans meet our requirements and are capable of protecting the public. While the NRC holds to operator to account for their on-site performance, FEMA evaluates how well the offsite response organizations perform during exercises to ensure that they are meeting FEMA requirements. If you live near an operating nuclear power plant, you should already know whether you work or reside in the “Emergency Planning Zone.” This information would come from your state or local government. You could also receive an annual mailing from the plant. The exact zones and their configurations depend on a number of factors, such as specific site conditions, population and local emergency response. In the event of an emergency, the plant operator will be in close contact with state and local officials, including emergency responders. Local officials, not the NRC, will make decisions regarding the best course of action. These decisions will factor in technical information about the plant and the weather, as well as other details regarding local emergency plans. That is why it’s important to tune in to their instructions. It is important to keep in mind that evacuation is not always the best course of action. Depending on your location, you may or may not be advised to take potassium iodide as a way to protect your thyroid. State and local officials are in the best position to make these decisions, so do not take action until you receive instruction from them. If you want more information on emergency planning, see our website. For more information on National Preparedness Month, check out this website. And don’t forget that FEMA has set aside Sept. 30 for America’s PrepareAthon, an opportunity for everyone to prepare for specific hazards that might affect them. Because emergency preparedness is so important to the agency’s mission, the NRC has requirements to ensure nuclear power plant operators — and the NRC staff — are prepared to respond to events. And our rules require plants to have up-to-date emergency plans. The NRC shares federal oversight of nuclear power plant emergency preparedness with FEMA. States have the overall authority for making protective action decisions for residents in the area, such as sheltering and evacuation, if there is an event at a plant. Local emergency responders also have an important role in protecting the public. Region I incident response personnel participate in an exercise. Plants must practice their emergency plans periodically to make sure plant staff is prepared to deal with a radiological emergency. Every other year, both the NRC and FEMA evaluate emergency response exercises at each operating plant, with both the state and local emergency responders participating. NRC inspectors monitor the on-site response. They watch over the shoulders of operators and emergency responders to assure they’re correctly evaluating conditions, taking appropriate steps to deal with the reactor conditions and communicating well with off-site agencies, including the NRC. FEMA evaluates the efforts of state and local governments, and emergency responders. The NRC staff must also be prepared to respond to an emergency. So several times a year, we participate in exercises, too. For example, the NRC’s region I recently participated in an emergency exercise for which we sent a site team to participate alongside plant emergency responders, and state and local emergency response agencies. We had staff in the various emergency facilities, including the simulator, the plant’s emergency operations facility, the joint news center and the state operations center. We also staffed our own incident response center in the Regional Office. Participating in exercises gives us a chance to practice how we’d respond in an actual event. That means the NRC staff monitors and independently assesses reactor conditions, performs dose calculations, and reviews protective action recommendations. We also “issue” press releases, participate in mock news conferences, and interact with federal and state officials, and local emergency management agencies. Afterwards, we take a look at what worked, and what didn’t go so well, and make changes to our procedures so that we’re continually improving. We also learn from real events, like Hurricane Sandy, and put those lessons into place, so that the next time, we’re even better prepared. While the NRC’s authority is limited to nuclear power plants and other civilian uses of nuclear material, dams play a role in what we regulate. Hydroelectric dams, for example, have supplied backup power for at least one reactor. A few reactors are downstream from various kinds of dams, so keeping the dams safe also helps keep the reactors safe. We do our part in all this by participating in the Interagency Committee on Dam Safety. The federal government founded the committee in 1980 to help create and maintain effective programs, policies, and guidelines to enhance dam safety and security. FEMA chairs the committee. We meet formally at least once every three months to discuss dam safety issues, but committee members work together on issues whenever necessary. For example, the NRC works regularly with FERC to inspect safety-related water retention ponds at a handful of reactor sites and evaporation ponds at two uranium mills. Other interactions included sharing operating experience and research results. A typical committee meeting involves members providing updates on major dam safety topics, such as proposed changes to federal guidelines or new training. The other members, including the NRC, provide advice and feedback that reflects each organization’s perspective. The NRC worked with other committee members related to the flooding hazard re-evaluations all U.S. nuclear power plants have been working on since March 2012, as directed by the NRC following the accident at Fukushima. We asked committee members to review parts of the re-evaluation guidance related to dam failures. The NRC incorporated the committee’s input into the final guidance to nuclear plants. We’ll continue to discuss the flooding re-evaluation process, including the results where appropriate, as part of the dam safety committee’s ongoing work.